The new Essex County Court House (pictured) cost $1,821,136.05 and the land cost $126,768.05 to build. Probably as fine a building as there is to be found in any part of the state is the Essex County Court House, which is located not far from the business centre of Newark. Its situation is such that it may be seen in all its white marble splendor for some distance from almost every point of the compass. Occupying a good-sized plot of high ground, at the junction of Market Street & Springfield Avenue, the building is conveniently located not only for lawyers, litigants and witnesses, but for spectators and visitors from out of town. Architecturally and from the standpoint of usefulness and convenience, the Court House represents the very best. In it are located the different county court rooms, the county offices, the grand jury room and the meeting place of the County Board of Chosen Freeholders. With well defined ideas as to the use for which the court rooms and each office were wanted, the building commission, having the construction task in charge, planned its work wisely and well. With an eye for the beautiful, it not only had the building so designed that its exterior and interior are good to look at, but it caused to be placed in the different court rooms and other rooms magnificent oil paintings, and outside of the buildings nine handsome marble, and two large bronze statues. Those in marble, which were placed on the upper part of the front of the building, represent, "Power of the Law," "Reason of the Law," " Statutory Law," "Protection of the Law," "Assault on the Law," " Disobedience of the Law," "Victim of the Law," "Shelter of the Law" and "Authority of the Law." On pedestals, at the sides of the steps to the main entrance to the building, are two huge figure case in bronze. One represents "Truth" and the other "Power." The cost of this sculpture work, which was designed by Andrew O'Connor was $56,500. In each pendentive to the central dome is a colossal female figure by Edwin Howland Blashfield. They symbolize "Wisdom," " Knowledge," "Power" and "Mercy." The large court room paintings were done by H. O. Walker, George W. Maynard, Kenyon Cox, Howard Pyle, Will S. Low and Frank D. Millet. They cost $41,000. To meet these expenses and the cost of the building, the county issued bonds. the site cost $126,768.05; the building called for an expenditure of $1,773,712 and the administration expenses amounted to $40,340.96. The architect was Cass Gilbert. The exterior is in the modern Renaissance style. 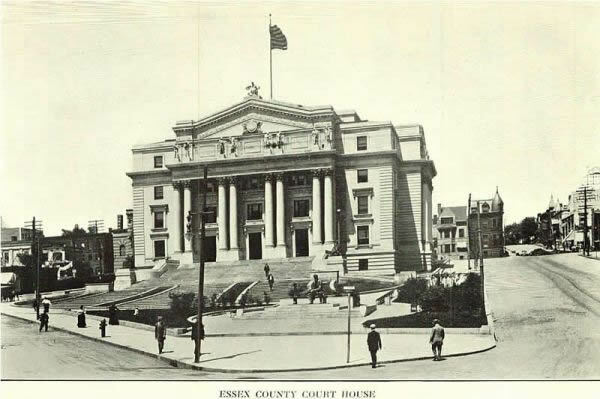 The Essex County Court House, a modern renaissance structure, erected in 1906-1908, from plans by Cass Gilbert. It stands on rising ground, facing east towards the apex of a long narrow triangle. A series of broad, low steps, in huge semi-circles, lends dignity and height to the approach. To the right, at the foot of these steps, is a memorial statue in bronze of Lincoln, seated, by Gutzon Borglum. Two seated figures in bronze, heroic size, by Andrew O'Conner, flank the main entrance: North, Power; south, Truth. On sides of granite bases are four reliefs in bronze, "When Law Ends Tyranny Begins." The exterior of the Court House is of South Devon marble, on a base of Vermont granite. The main facade is adorned with nine sculptures, heroic size, by Piccirilli Brothers, from models by O'Connor. 1-At the apex, The Power of the Law. Along the entablature, from left to right: 2-(Light) Reason of the Law; 3-(Maternity) Shelter of the Law; 4-(Thais) Protection of the Law; 5-(Cain) Assault upon the Law; 6-(Adam) Disobedience of the Law; 7-(Eve) Victim of the Law; 8_(Wisdom) Statutory Law; 9-(Learning) Authority of the Law. Cost of sculptures and bronzes, $56,500. The interior (open daily) deserves a detailed visit, being not only architecturally interesting but literally a museum of American mural paintings. The central rotunda, open from the ground floor to the roof, receives its light through the stained glass of the spacious dome, which is flanked by smaller domes to north and south. Encircling the central glass sky-light is a narrow band formed of the Twelve Signs of the Zodiac. Below these are four pendentives containing symbolic female figures, by E. Blashfield: 1-Wisdome Which Informs the Law (symbol, the unraveling of a skein); 2-Knowledge Which Bases the Law (symbol, searching the records for precedents); 3-Power Which Supports the Law (symbol, a sword and rods); 4-Mercy Which Tempers the Law (symbol, casting the vote of Mercy into the urn). South dome: Four small pendentives, 1. Zeus, 2. Odin, 3. Minerva, 4. Moses. North dome, four small pendentives, 1. Druid, 2. Isis, 3. Siva, 4. Buddha. In the court rooms on the 3rd floor: 1. Supreme Court (east front); The Beneficence of the Law, by Kenyon Cox "Under the Rule of Law, Inspired by Justice, Peace and Prosperity Abide." 2. Circuit Court Room A (south); The Landing of the New Englanders (on the banks of the Passaic River, May 17, 1666), by C. Y. Turner; 3. Motions Court Room (west): Diogenes in Quest of an Honest Man, by Will H. Low; 4. Circuit Court Room B (north): The State Supported by Liberty and Justice, by George W. Maynard. Second Floor: 1. Freeholders' Room, The Landing of Carteret, by Howard Pyle; 2. Grand Jury Room, The Foreman of the Grand Jury Rebuking the Chief Justice of New Jersey, in 1774, by Frank D. Millet; 3. Criminal Court Room, The Power and Beneficence of the Law, by H. O. Walker. Combined cost of mural paintings, $41,000. Built of white marble. The interior decorations are of special interest. There are nine marble and bronze figures symbolizing Law, designed by Andrew O'Connor, and mural paintings by the famous American artists, E. H. Blashfield, H. O. Walker, C. Y. Turner, Kenyon Cox, Will Low and Howard Pyle. Borglum's seated bronze figure of Lincoln is on the plaza.